Bacon. Need I say more? It is the ultimate flavor maker in any dish or served by itself with a fried egg. In this dish, however, bacon is not the star of the show but plays a very important supporting role to make the cauliflower and orzo shine in the spot light. Thanks to Dennis’ generous gift of his cooker, I am able to boil and fry food easily and efficiently. I love how the Mediterranean orzo turned out and wanted to try another version, this time with a recipe inspired by Melisa Rubel Jacobson from Food and Wine’s wonderful website. 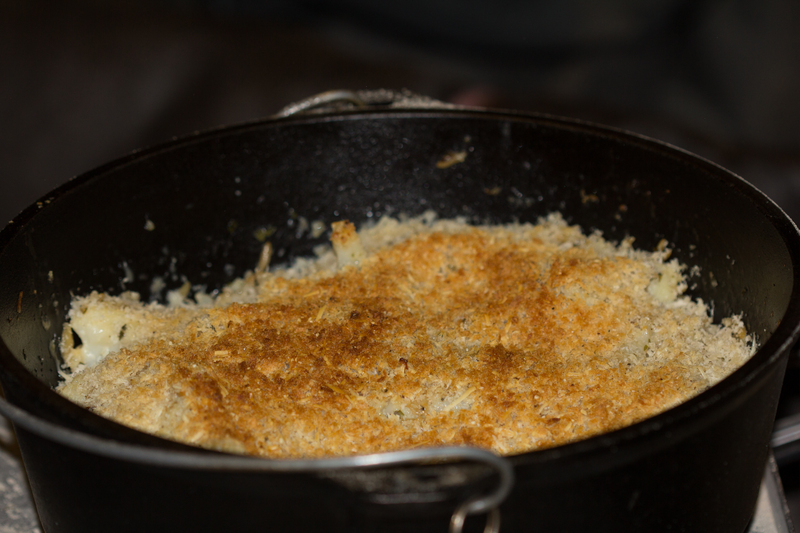 This recipe can be done in one or two 12-inch camp Dutch ovens and serves 10 hungry campers. Fire up a big chimney of charcoal. 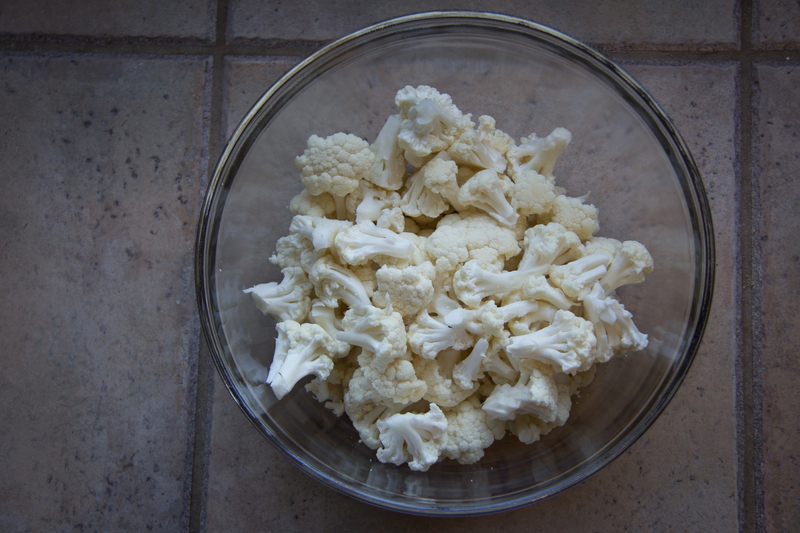 Wash and cut the cauliflower into bite size pieces and place in a large bowl. Add oil to the and toss the cauliflower until all pieces are lightly coated. Season with salt and pepper. Pour into 12-inch camp Dutch oven. Place oven over a ring of 8-9 hot charcoals then cover the lid with hot coals. Stir every five minutes until cauliflower is fork-tender and is starting to caramelize. 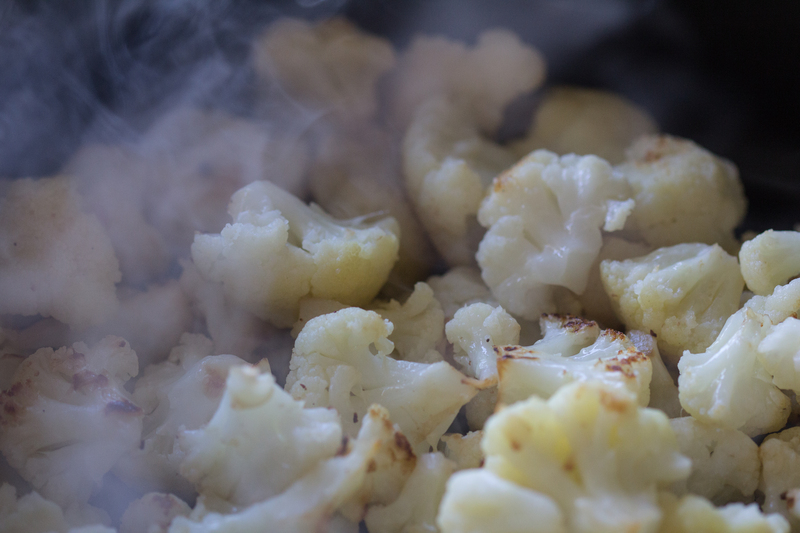 Remove the cauliflower from the oven and set it aside. 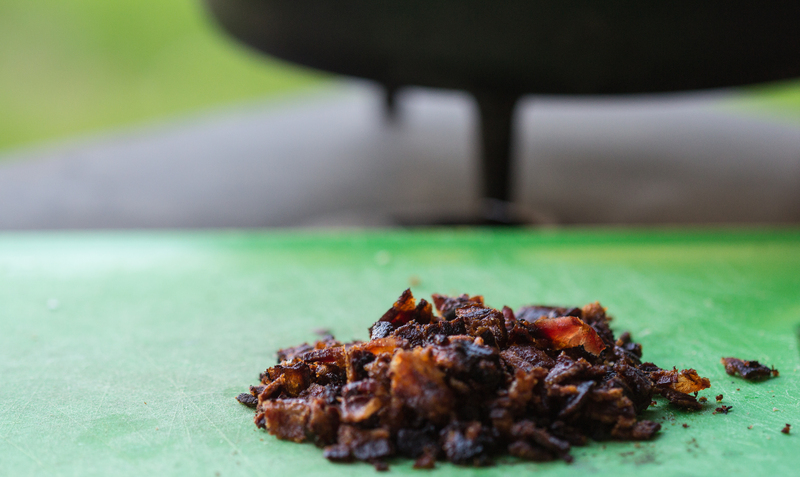 Fry bacon in the bottom of the 12-inch camp Dutch oven by placing it over a big pile of hot charcoals. If you don’t have a vented cook station like Dennis’, you may have to remove the oven occasionally to stir up the charcoals and give them some fresh air to keep them hot. When the bacon is crispy, remove it from the drippings, let it rest on a paper towel, then chop it up. Add the chopped onions to the bacon drippings and sauté until they are sweet and clear, about five minutes. Add garlic and stir for another minute. Make a hole in the center of the onions and garlic and pour orzo in the center. Let it start to brown for a minute, then stir and let it brown for another minute. Add chicken stock and chives, then stir. Bring the stock to a boil and stir frequently to keep the orzo from sticking to the bottom of the oven. The orzo will be done in about 8 minutes. I stirred it constantly and kept a close eye on the orzo toward the end, pulling the oven off of the charcoal when the chicken stock was almost gone. Make the crunchy topping by mixing together half of the grated parmesan with the Panko bread crumbs, then stir in the olive oil, salt, and pepper. 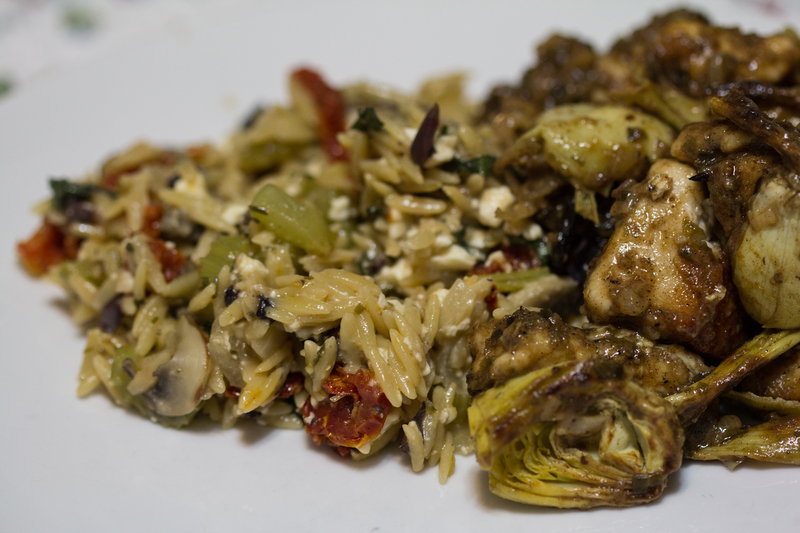 Stir the roasted cauliflower into the orzo. Stir in chopped bacon, cream, and the other half of the grated parmesan. Sprinkle the bread crumbs and parmesan across the top of the cauliflower. Place lid on the oven and pile on as many hot charcoals as you can fit safely on top to brown the crunchy topping, about five minutes. 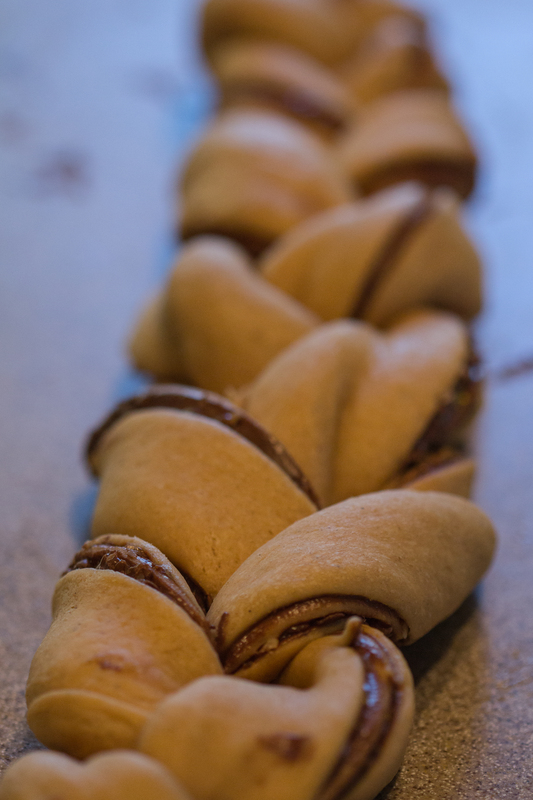 This is another delicious recipe that I love and hope you do as well! This side dish can easily become the main dish by adding smoked sausage or grilled chicken. Add More Butter is a lovely food blog, filled with beautiful images and inspiring recipes made by Hope, a Pastry Chef in a five star London hotel. I started following her blog recently and am inspired by her ideas for flavors, textures, and delicious food. 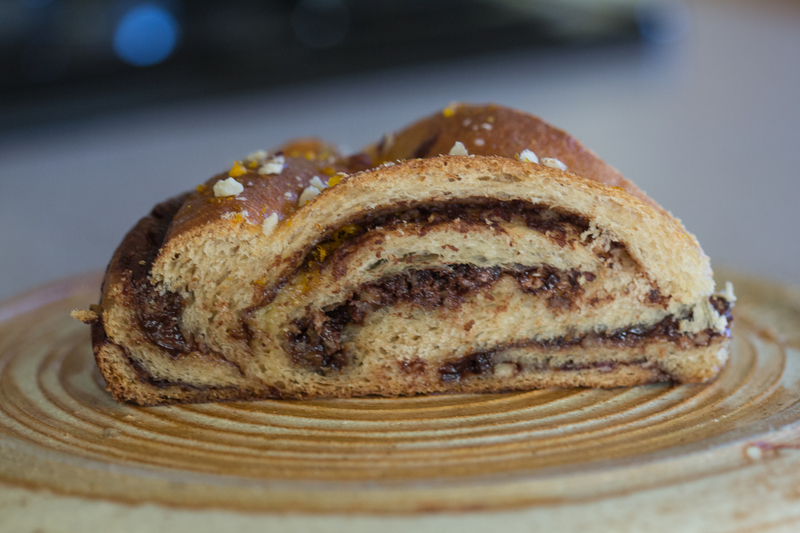 I tried her Chocolate and Hazelnut Butter Buns with Orange Glaze and loved the results (so did everyone at Steve’s office) but I wanted more spice in the dough. 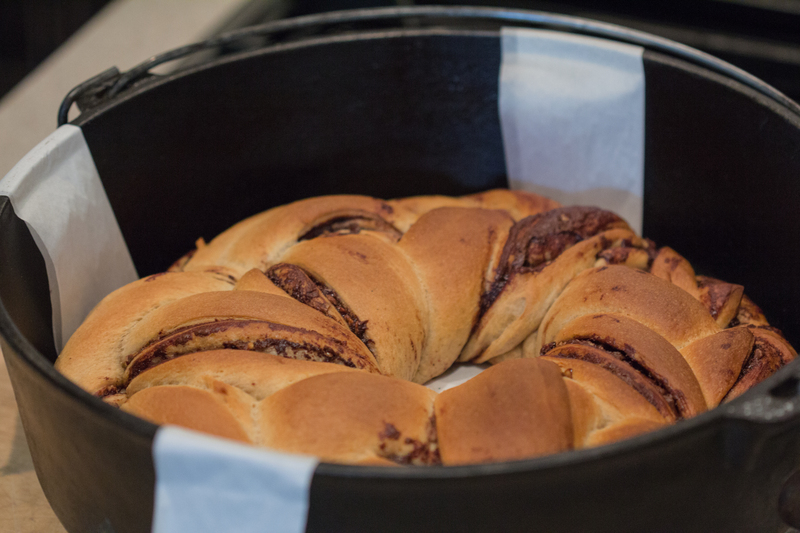 I also had a jar of Nutella to use, and wanted to shape the bread differently, so I made this version of Hope’s recipe in our 14″ camp Dutch oven. 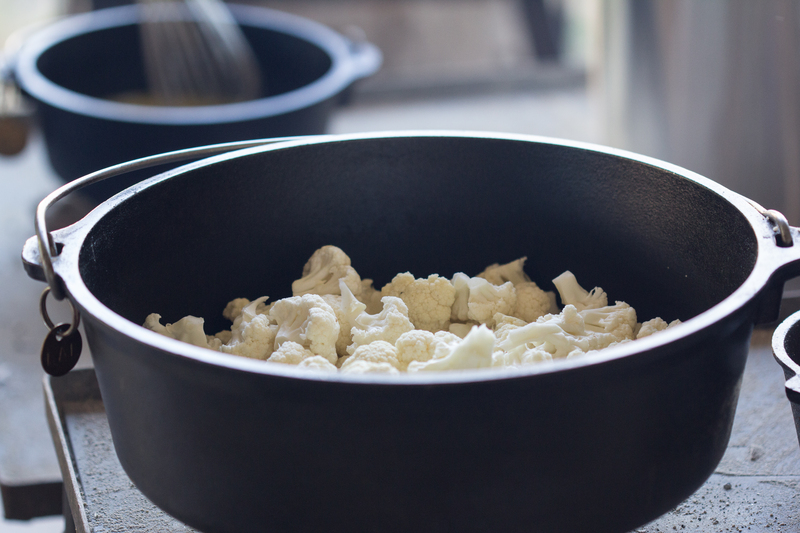 Prepare a 14-inch camp Dutch oven by cutting a long piece of parchment paper about 30-inches long. 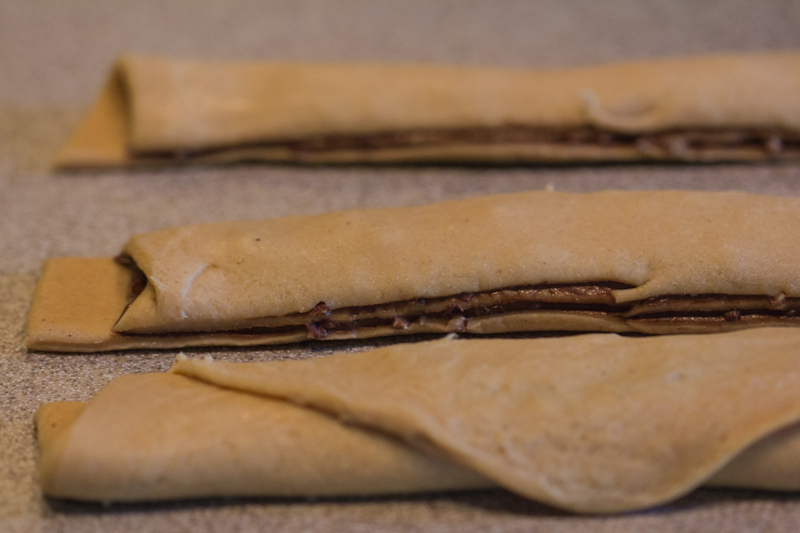 Fold it into thirds lengthwise and cut three long strips. Fold two strips in half lengthwise and save the third for another application. 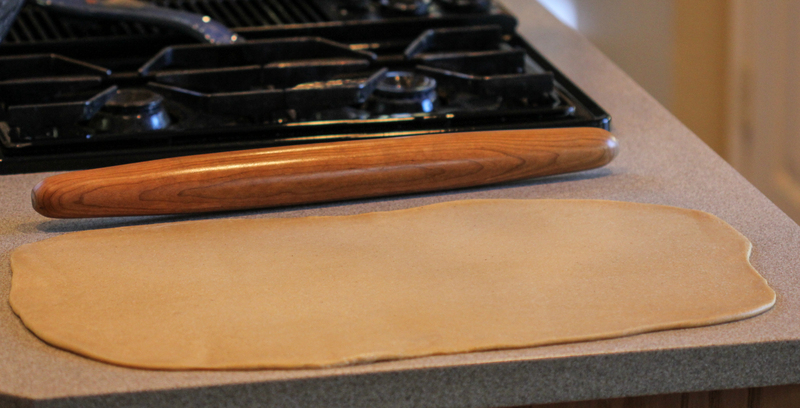 Cut another piece of parchment paper to fit in the bottom of the oven. Place the two long strips in a cross at the bottom of the oven then lay the circle of parchment on top of the crossed strips. Clip the long strips over the edges of the oven to secure them in place. The parchment paper strips and circle will help lift the bread out of the oven and make cleaning the sticky glaze a little bit easier. Warm up the milk/half-and-half to about 100 to 110 degrees Fahrenheit. Pour into a large mixing bowl, then stir in sugar and yeast. Let this sit for a few minutes until the yeast starts to bubble and is fragrant. If nothing happens, toss it all out and start over. Stir in warm butter and mix until it disappears. Add eggs, ginger, cardamom, cinnamon, and salt. Gradually add flour, 1/4 cup at a time until the dough starts to get sticky. Liberally sprinkle the counter with flour then turn the sticky dough out and sprinkle again with flour. 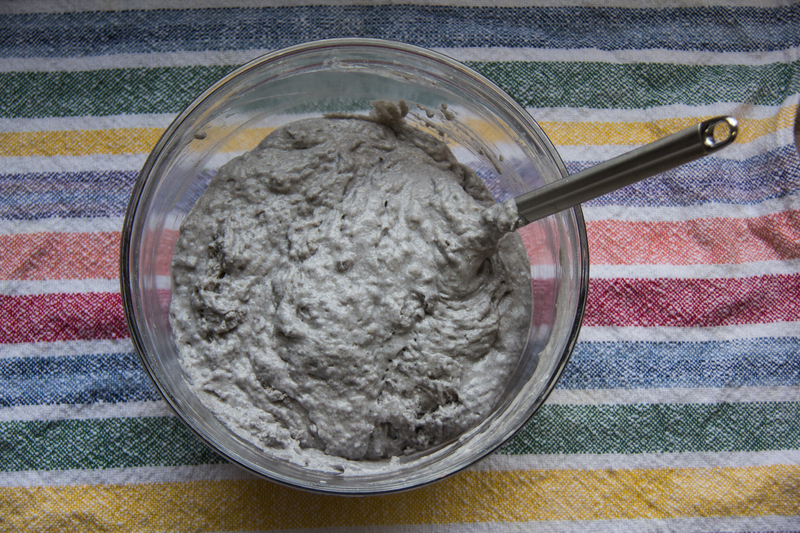 Knead the dough, adding flour until the dough is smooth and no longer sticking to your hands. (You may not use all of the flour.) Knead for five to ten more minutes until you can pull a window pane. Drizzle a little bit of oil or melted butter into a bowl that is at least twice the size of the dough or into a dough bucket. Turn the dough around in the oil/butter to cover the bottom of the dough, then turn it over and repeat. Cover bowl tightly with plastic wrap or put the lid on the bucket and place in a warm, draft-free place for one to two hours until the dough has doubled in volume. You can also make the dough then night before and let it rest over night in the refrigerator. 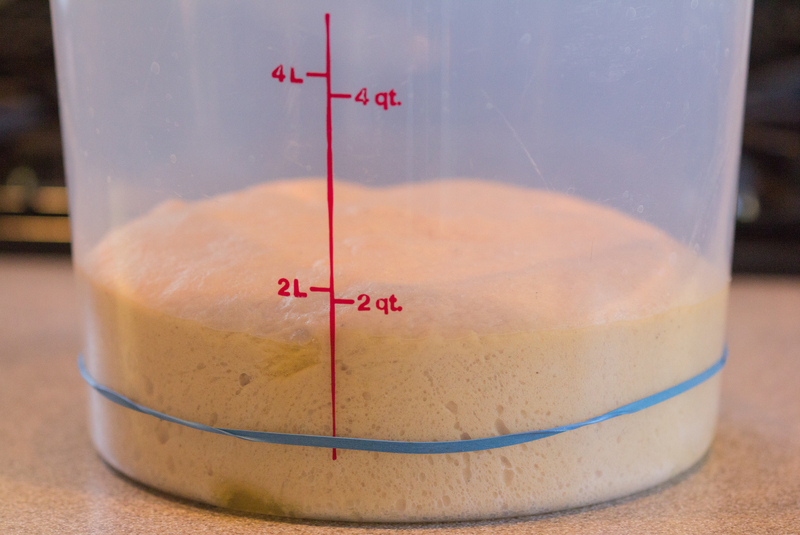 If you do this, take it out of the refrigerator and let it come to room temperature before shaping the dough. 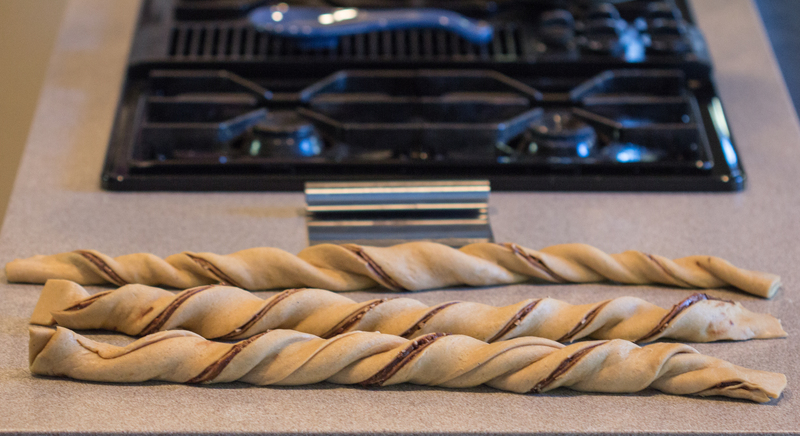 Turn dough out onto a large counter space (at least 30×30 inches) and roll the dough out into a large rectangle that is about 26-inches long and 16-inches wide. The rectangle doesn’t have to be perfect, but needs to be at least 26-inches long. 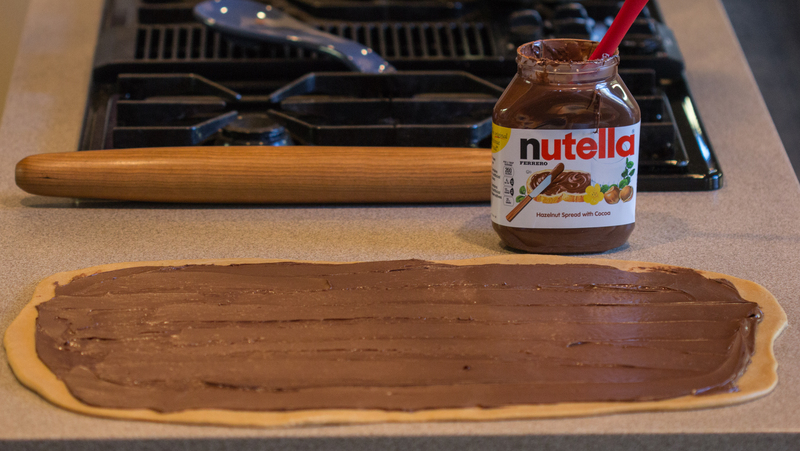 Spread the Nutella out across the dough, leaving about 1/2-inch at the edges. 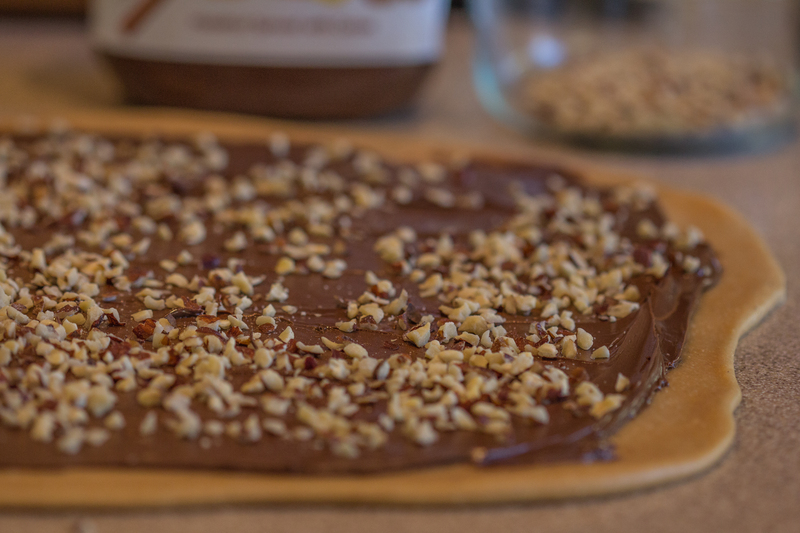 Sprinkle 3/4 cup of chopped hazelnuts across the Nutella. This is where the sticky fun begins! Gently pick up one third of of one of the long sides and fold it over. Then pick up the other long side and fold it on top of the other third, like you would fold a business letter only lengthwise. 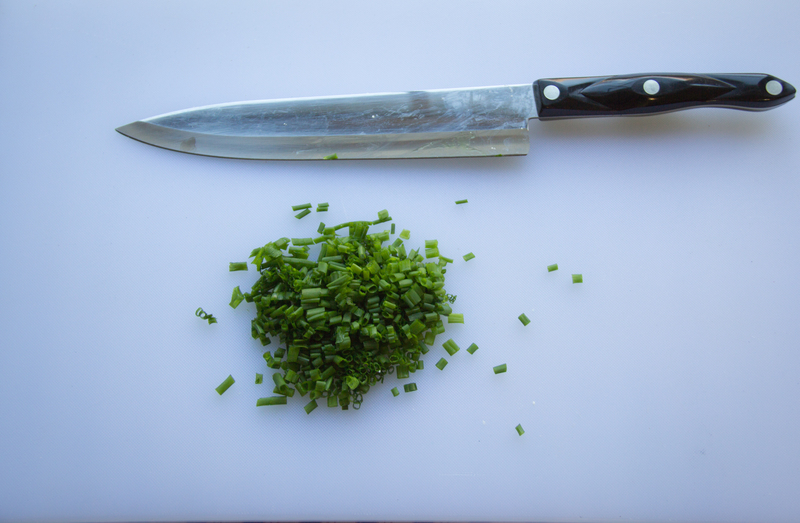 Using a bench scrapper or a sharp knife, cut three pieces lengthwise. For a nice clean cut, use a single downward cutting motion, not a back-and-forth sawing motion as this will rip the dough. Make sure each piece is completely separated from the others. Move each long piece apart and twist 8 or 9 times. Braid the twisted pieces together loosely. 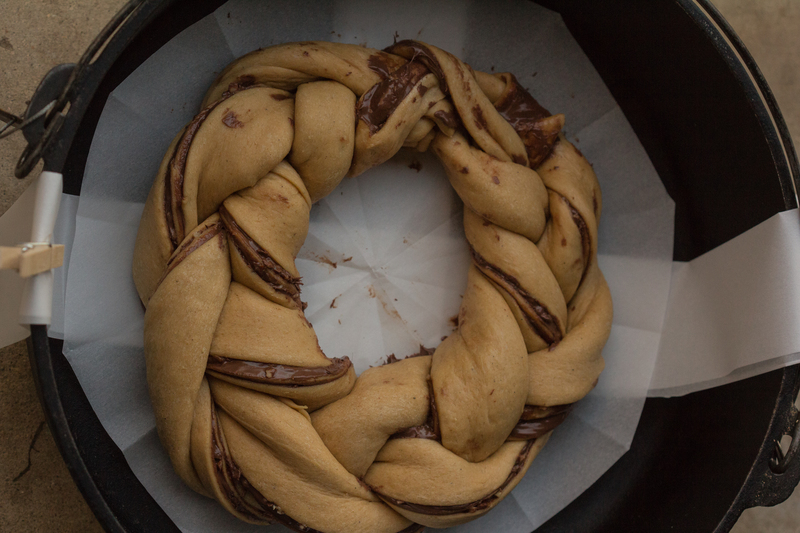 Move the braid into the prepared 14-inch Dutch oven and shape into a circle. The ends will be a bit messy, just try to tuck them into each other. When the dough rises up, you will be the only person who knows it was messy! Cover and place in a warm, draft-free place for an hour. 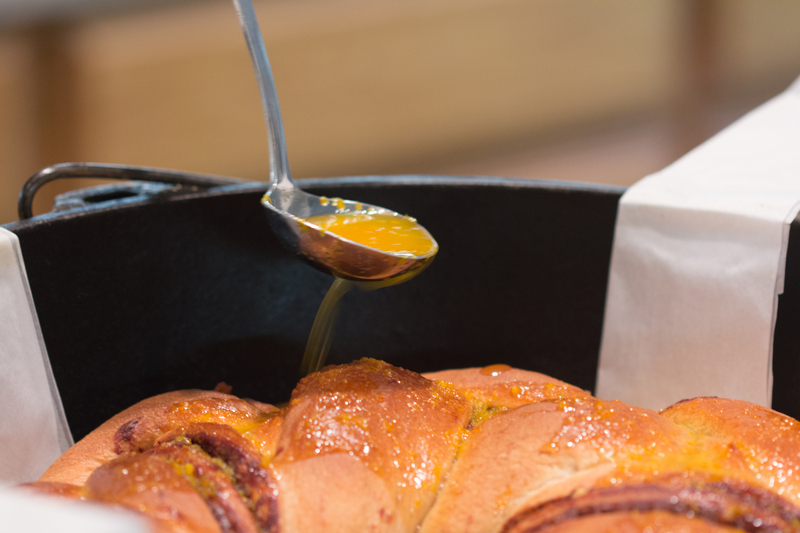 While the bread is rising, make the orange glaze. 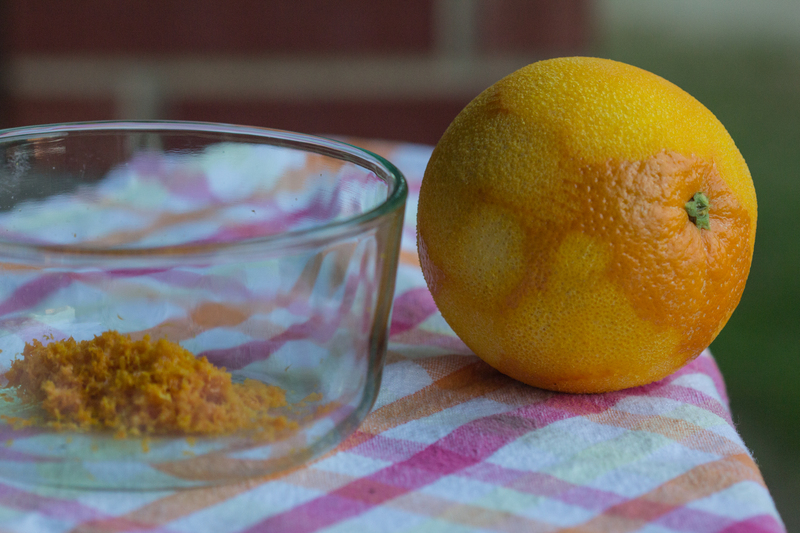 Zest the orange into a small bowl, about 2 to 3 tablespoons of zest. 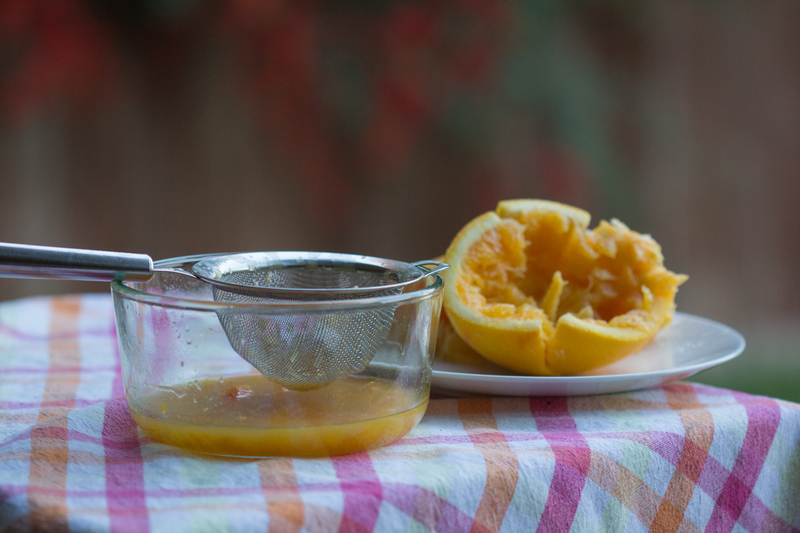 Squeeze orange juice into the zest, about 1/4 cup. Stir in superfine sugar. If you are using regular sugar, let the glaze sit for a while to allow the sugar crystals to dissolve completely. Fire up a chimney of charcoal. Bake at 350 degrees Fahrenheit by placing 11-12 hot charcoals in a circle underneath the oven and 17-18 hot charcoals on the lids. Bake for about 30 minutes. Bread is done when it is golden brown and the internal temperature is 195 to 200 degrees Fahrenheit. Let the bread rest in the oven for at least five minutes to cool the oven off a bit before adding the glaze. 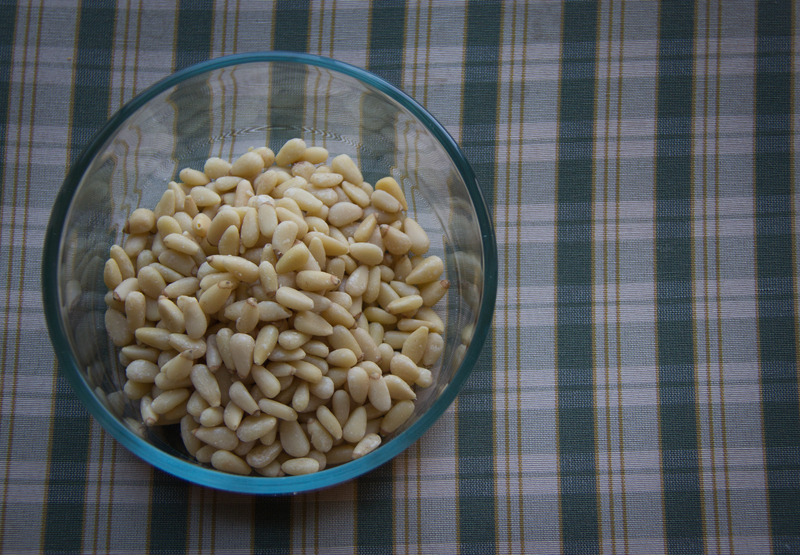 Spoon the glaze over the warm bread, then sprinkle remaining hazelnuts across the top. Oh this is simply divine! 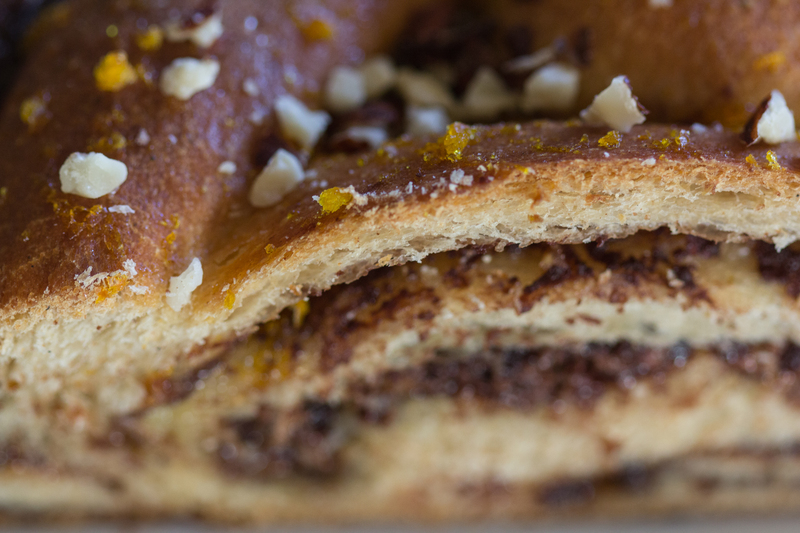 The hint of orange makes the chocolate and hazelnut flavors explode together and the cardamom and other spices sing quietly together in the flaky layers. I love this recipe and hope you do as well! This is adult comfort food at its best, served around the campfire underneath a canopy of brilliant stars or in your back yard. I love artichokes, thanks to my parent’s love of these prickly vegetables that grow in California. 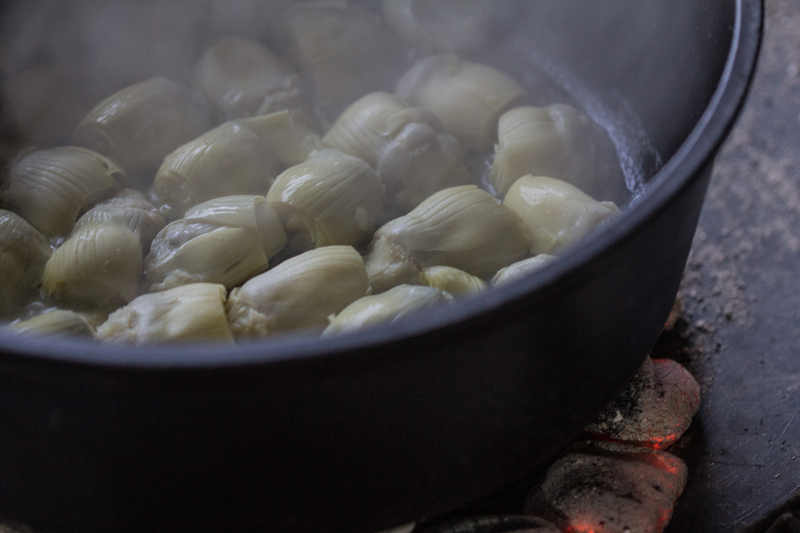 When I was a little girl, my mother would boil big artichokes, which were a rare treat in northern New Mexico, until the inside of the leaves were tender, then she would serve it, steaming hot, with a jar of mayonnaise. We peeled off a leaf, dunked it into the mayo, and scraped the sweet tender meat off of each leaf with our teeth – such a simple joy that still makes my heart smile. 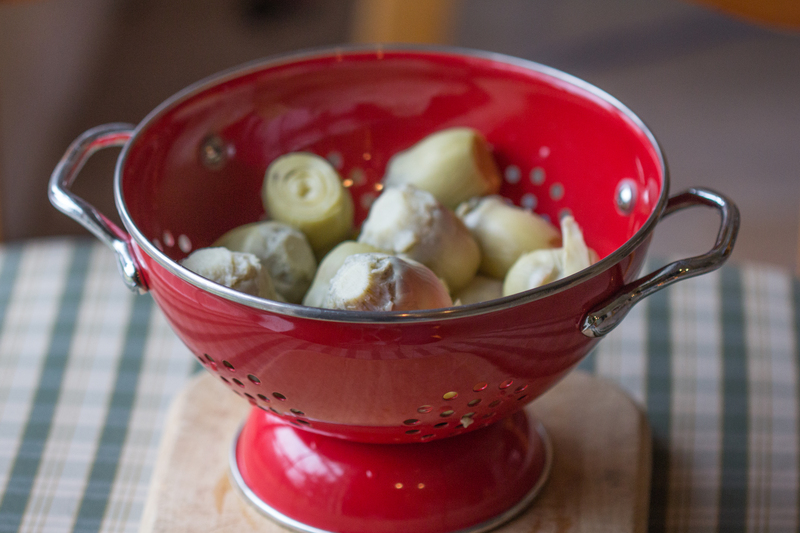 When I discovered canned, frozen, and marinated artichoke hearts I was in foodie heaven. They are already cooked and ready to eat! 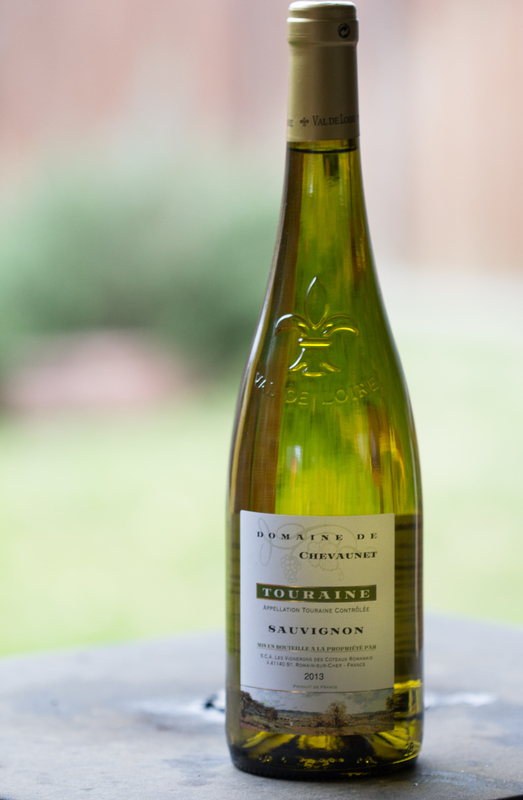 So tonight I am going to make chicken and artichoke hearts in a white wine sauce served over Mediterranean orzo. This can be done in one 12-inch camp Dutch oven, if you have plenty of time, or you can make it in two ovens concurrently to save some time. Serves 4 to 6 hungry and lucky loved ones. Fire up a chimney of charcoal. 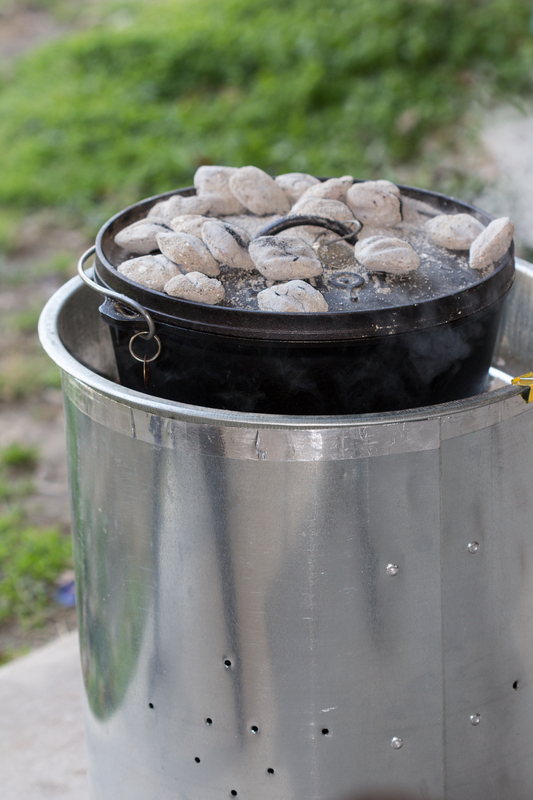 If you have one of Dennis’ Cookers, set it up and make sure the Dutch oven sits level in the cooker. You will appreciate the air holes underneath the oven to keep the charcoal very hot to sear the chicken, roast the artichoke hearts, and make the orzo. Put the lid(s) to the oven(s) aside. You will not need them! Cut artichokes in half lengthwise. Let them drain on a paper towel, cut side down. Cut chicken into bite size pieces. Season with salt and pepper liberally. Put the flour into a bowl and drop seasoned chicken in, one at a time, tossing to coat with flour. Place in cooler. Make a heap of hot charcoals and place the Dutch oven on top. Add olive oil until it covers the bottom of the oven and then add 2 tablespoons butter. 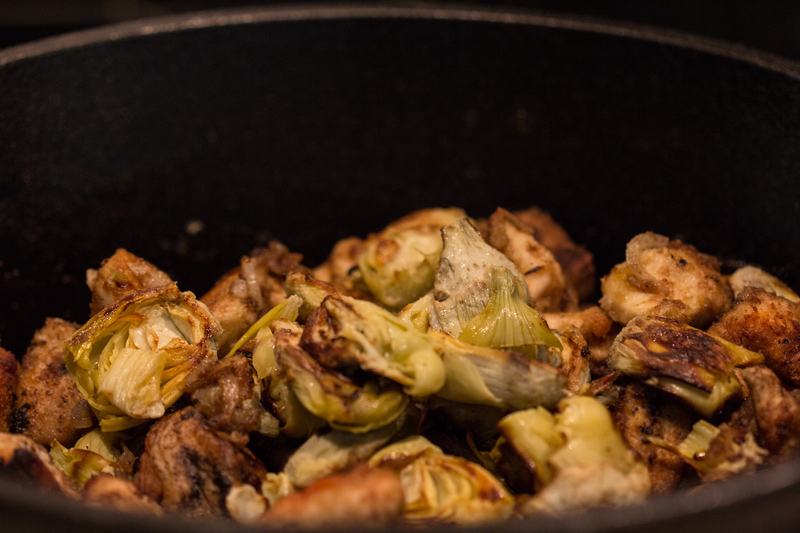 When the butter is melted, add artichoke hearts, cut side down and resist the temptation to move them. Let them sizzle for 5 to 10 minutes, or until you can smell the sweet caramelization and see the dark color when you lift one up. Flip them over and let the leaf side brown for a few minutes. Remove and place on a plate lined with a paper towel. Cover with aluminum foil to keep warm. Add 2 tablespoons of olive oil and butter. When the butter is melted and oil is hot, add half of the flour-covered chicken. Let the chicken sizzle for 3-5 minutes until dark brown, then flip. When chicken is nicely browned on all sides, remove to a plate covered with a paper towel and covered with aluminum foil to rest while you sauce the remaining chicken pieces. Repeat. Add 2 tablespoons olive oil and butter, then chicken. Remove and cover with foil. 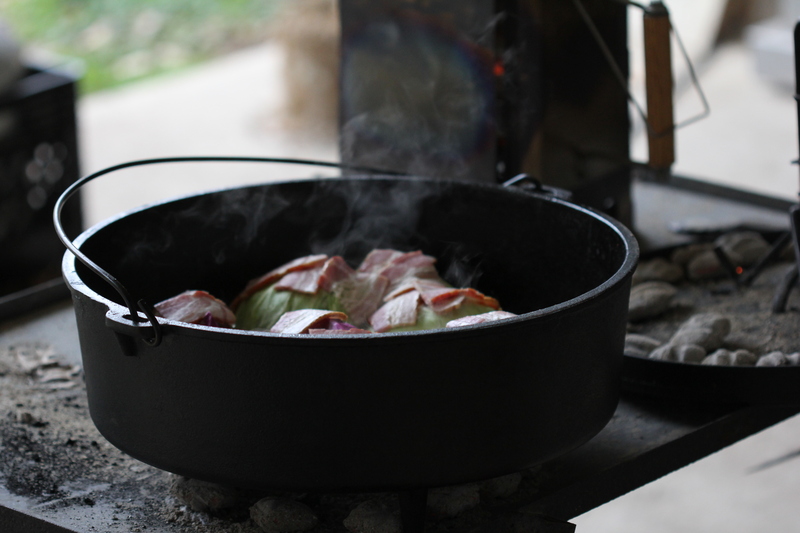 Add shallots and briefly sauté them in the oil and bits left from the chicken, then add white wine to deglaze the yummy bits off of the bottom of your camp Dutch oven with a wooden spoon. Add the chives and let the sauce reduce and firm up for about five minutes, stirring constantly to prevent it from burning. Remove from heat when sauce has thickened. Finish by squeezing half a lemon into the sauce. Stir. Taste. Add more lemon if it suits your palate. End with 2 tablespoons of butter. Toss the cooked chicken, artichokes, and onions in the wine sauce. Resist the temptation to stop and sit down to eat the chicken and chokes. Cover and keep warm while preparing the orzo. Place a 12-inch camp Dutch oven over a heap of hot charcoals. Dennis’ cook station is ideal for this application. Heat olive oil until it starts to shimmer, then add chopped onions and sauté until they start to soften, about five minutes. Add orzo and stir constantly to turn the orzo a slight shade of brown. Add chicken stock and chives, then bring to a boil. Use your best outdoor cook judgement as you let the orzo simmer, stirring frequently and keeping an eye on it to make sure the orzo doesn’t stick to the bottom or burn. Total cooking time for the orzo is around 9 minutes. As the chicken stock reduces, increase y0ur attention to the orzo. Taste it frequently to see if it is done and stir to keep it from burning. When there is very little chicken stock at the bottom of the oven and the orzo is tender, pull it off of the charcoal. 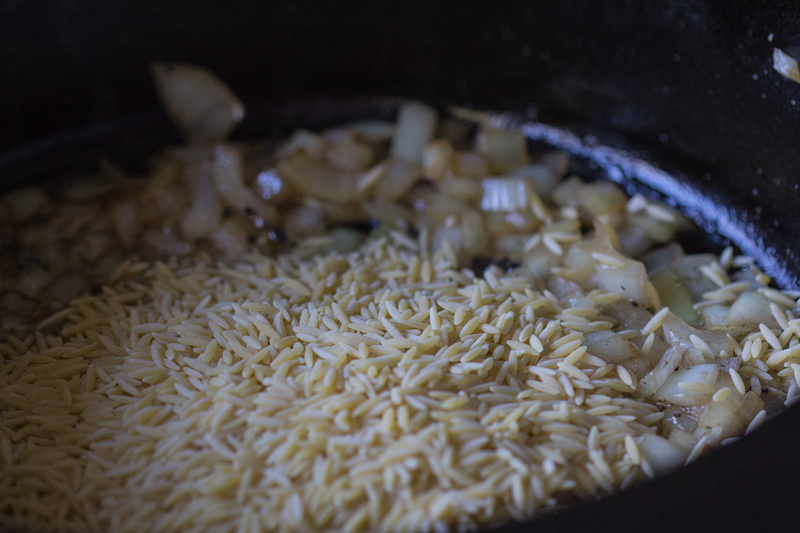 If the orzo is not done, add a few splashes of chicken stock and let it simmer, stirring, until orzo is done. Stir in feta cheese, olives, and sun-dried tomatoes. Taste and add salt if needed. The feta and olives should add enough salt, but check just in case. Now, aren’t you glad you waited? 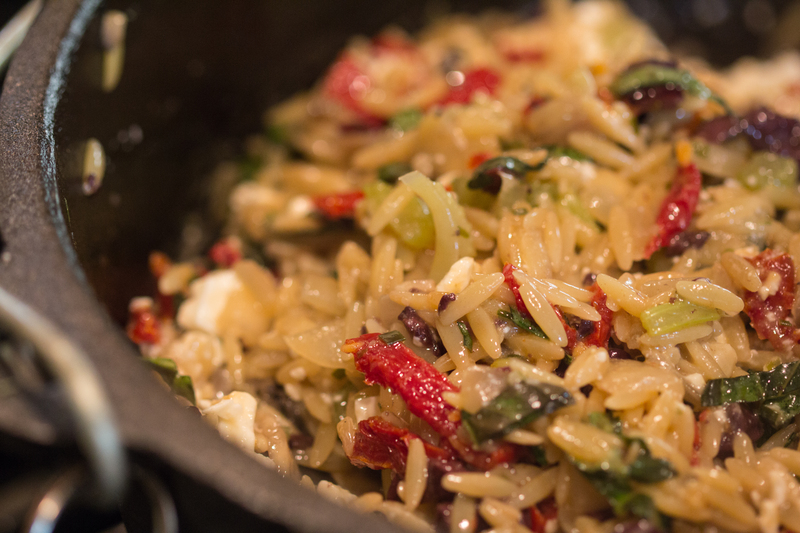 The orzo is so good with different flavors of mushrooms, sun-dried tomatoes, sweet celery coming together with the feta cheese. And the wine sauce, infused with sweet shallots, makes the chicken and artichokes sing together in your mouth. The delicious Mediterranean orzo recipe was inspired by Andrea Bemis, contributor to The Kitchn. 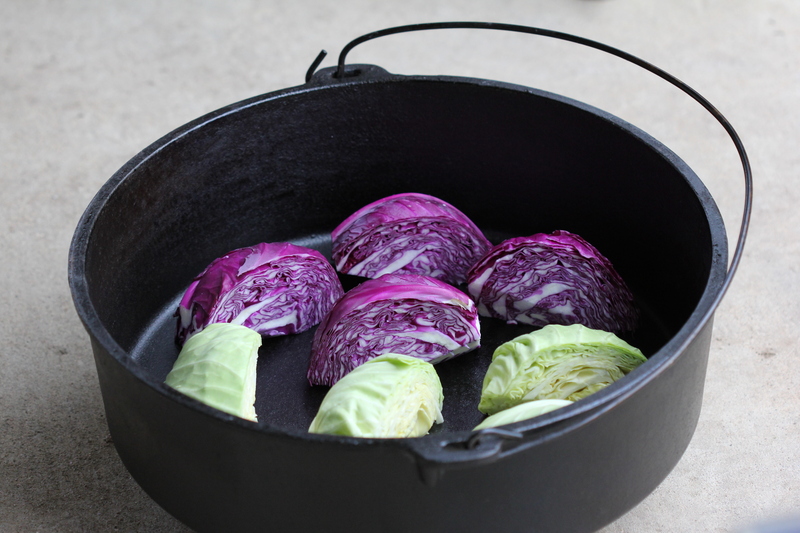 Red cabbage is going to be the star of this dish. Don’t they look like angels, joyful arms and wings raised in praise and song? I want to make more side dishes with vegetables, so tonight we will braise regular and red cabbage in chicken stock and topped with bacon. Serves eight to ten hungry friends. Peel off discolored outer leaves from the cabbages. Divide into quarters and remove center stem. 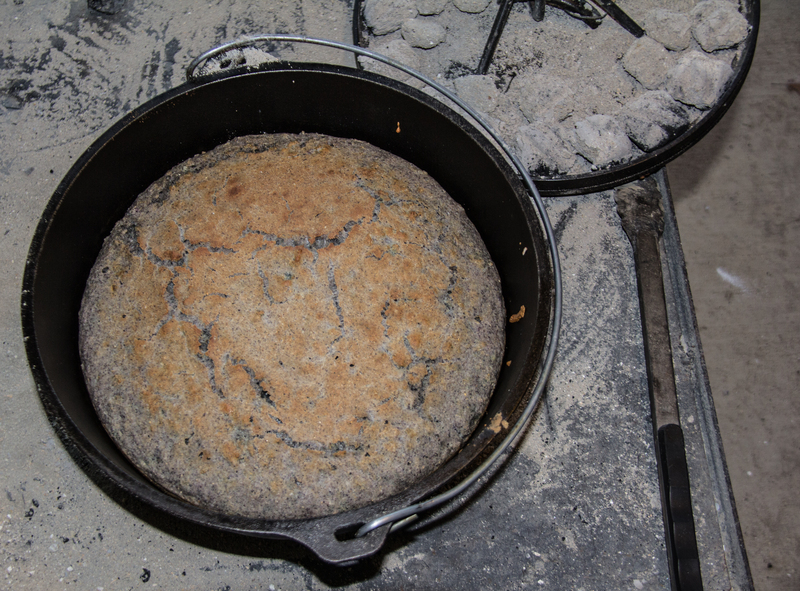 Place in a large camp Dutch oven (a 14-inch or 16-inch) with cut side down. Distribute onions around the cabbages. Pour chicken stock over the cabbage. Season with salt and pepper. 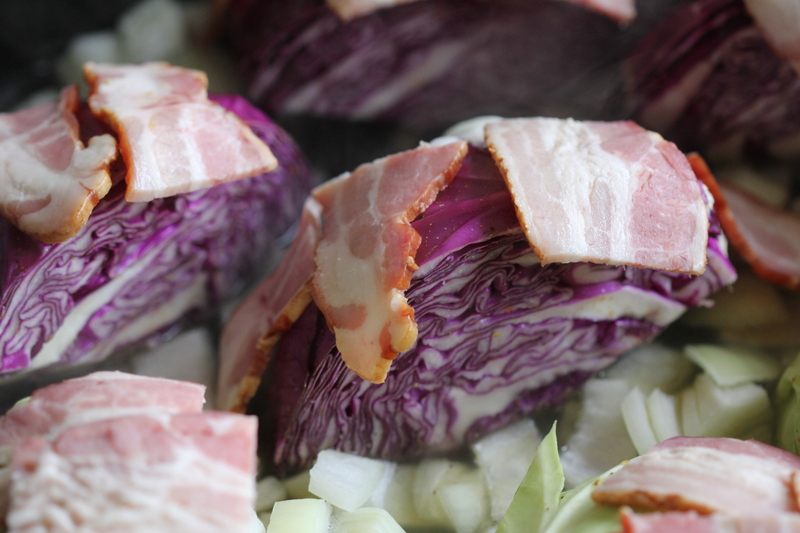 Drape bacon pieces across the tops of the cabbage. 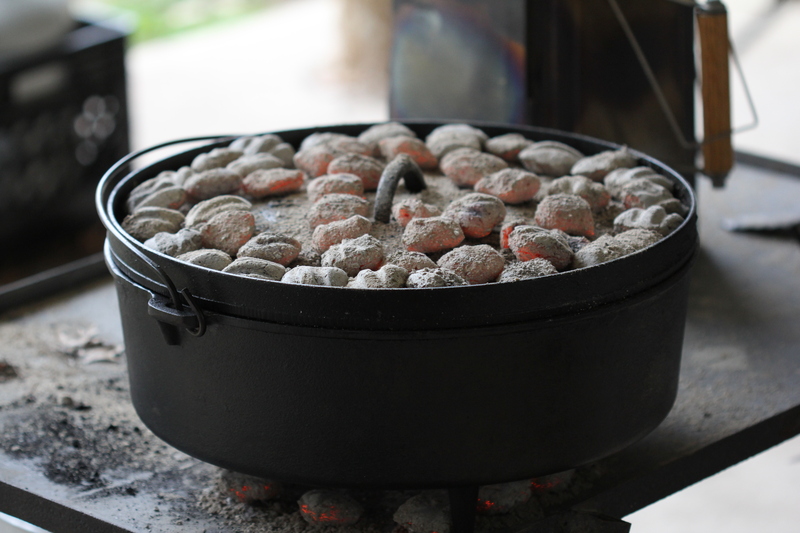 Make a circle of 14 hot charcoals and carefully place big Dutch oven on top. Place lid on the oven and put a tight circle of hot charcoals around the lid. As the charcoal burns down, add more to the lid. After about 30 minutes, remove old charcoals and replace with new hot charcoals to keep the temperature constant. 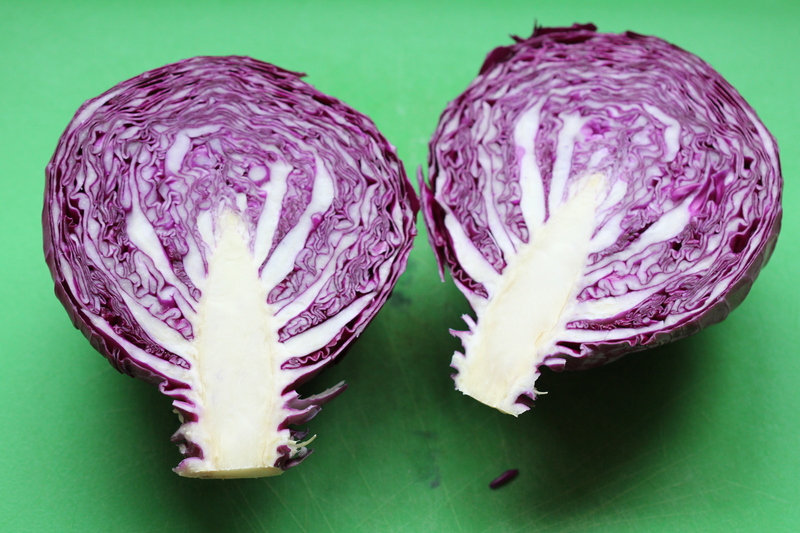 After about an hour, poke a fork into the cabbage to make sure it is tender. The bacon should be brown and crispy. If the cabbage is tender, remove the lid and add a bunch of hot fresh charcoal underneath the oven to reduce the remaining liquid. Ahhh, I love this slightly sweet and savory vegetable dish! 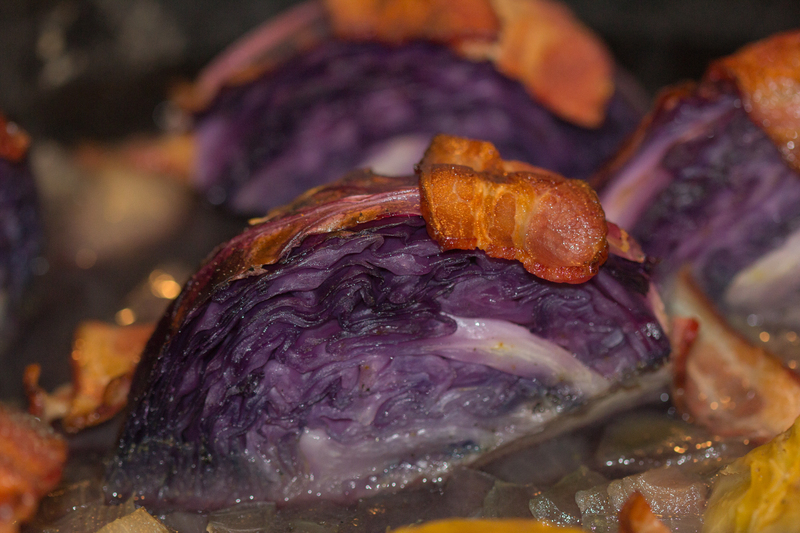 The bacon brings out the best of the cabbage, the chicken stock makes the cabbage tender and flavorful, and the colors are simply lovely. Next time, I won’t mix the regular and red cabbages because the purple-blue color from the red cabbage tinged the green cabbage an unpleasant way. I will also add a drizzle of aged balsamic at the end, which was my plan but I forgot tonight. We may be making this for our Prairie Dog friends at the next DOG (Dutch Oven Gathering). If you make it, please let me know! Enjoy! When our friend Dennis agreed to let us record the process he follows to make his lightweight cook station, I was thrilled! We spent most of Saturday with Dennis in his shop, watching him go through each step of the project and admiring his creativity, while we shot hours of video. So here it is! This series of six videos (each about 5 to 6 minutes long) gives step-by-step instructions, explanation of what tools work the best for the project, and lists the materials needed to make the cooker. 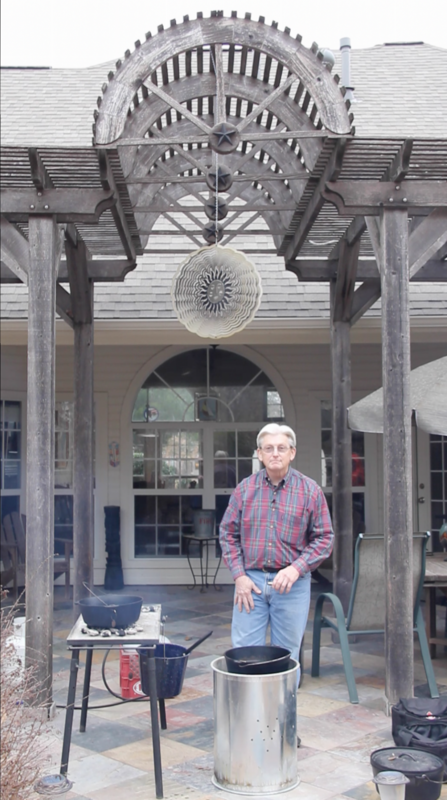 An unexpected bonus to this project was hearing Dennis sing Raised By The Railroad Line with his friends in the band Augusta Road. The beautiful bluegrass music featured in these videos are from their CD made in 2014. 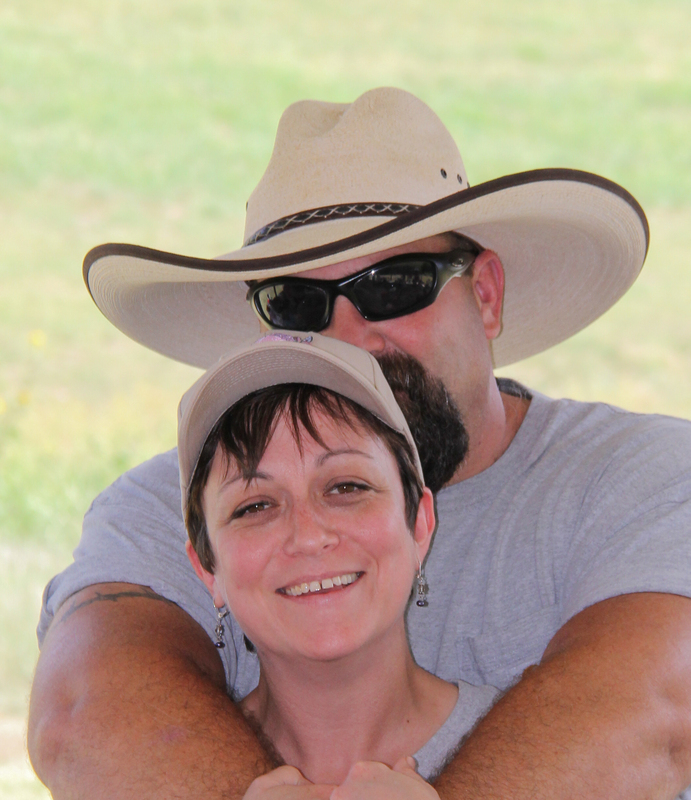 Members of the band are Jed Mobley, Julie Tucker, Mike Tucker, and Lynn Gray. The CD was recorded and produced by Mike Tucker from Longview Texas. Thank you Dennis for sharing your idea and showing us how to make your cook station! Thank you also to my husband, Steve, for helping with the camera and other important tasks. If you make one of Dennis’ cook stations, please let me know by leaving a comment. Dennis will be honored to know that his idea is being put to good use! Check out this beautiful blue corn meal, delivered in person by Brent Bolton! Brent is a Dutch oven friend who stopped by recently and shared a bag of his hand-ground blue corn meal. I love the subtle grey-blue color and its sweet light taste. 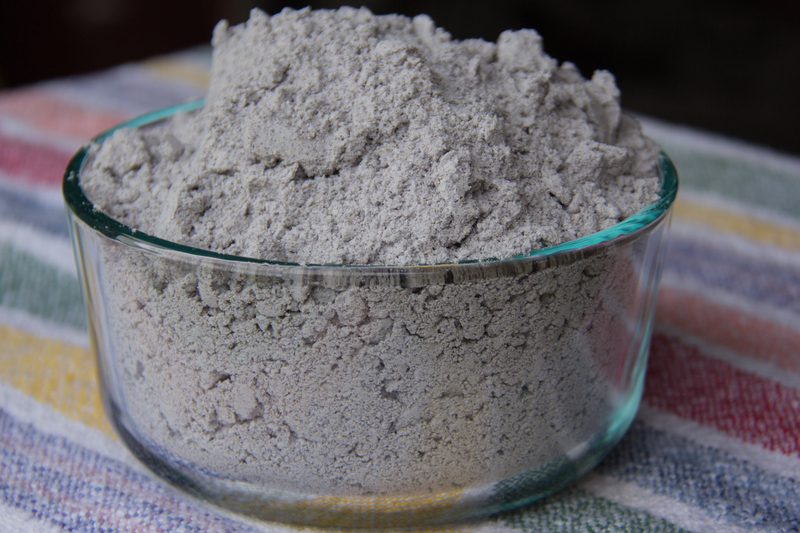 Blue corn has 30% more protein than hybrid corn and is a staple in southwestern recipes. Brent and I share a love for New Mexican flavors, so when he offered this lovely gift, I glad accepted! 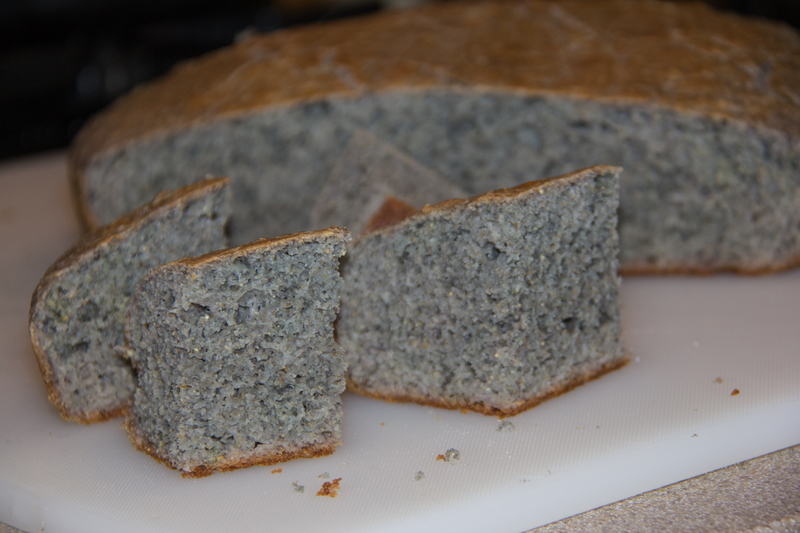 I modified our cornbread recipe just a little to make this Blue Cornbread recipe with buttermilk (no regular milk). I can’t wait to taste and see it! 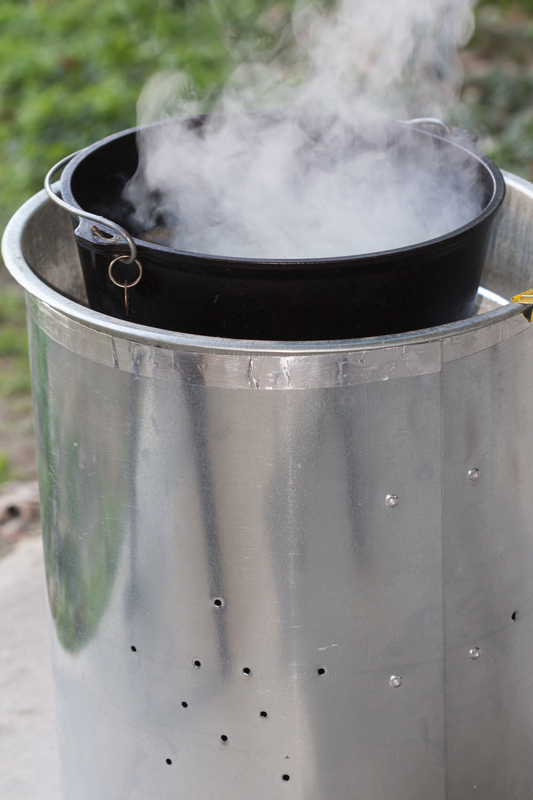 Pour canola oil into a 12″ camp Dutch oven. Preheat the Dutch oven to 425 degrees Fahrenheit (21 hot charcoals on top and 11 underneath). 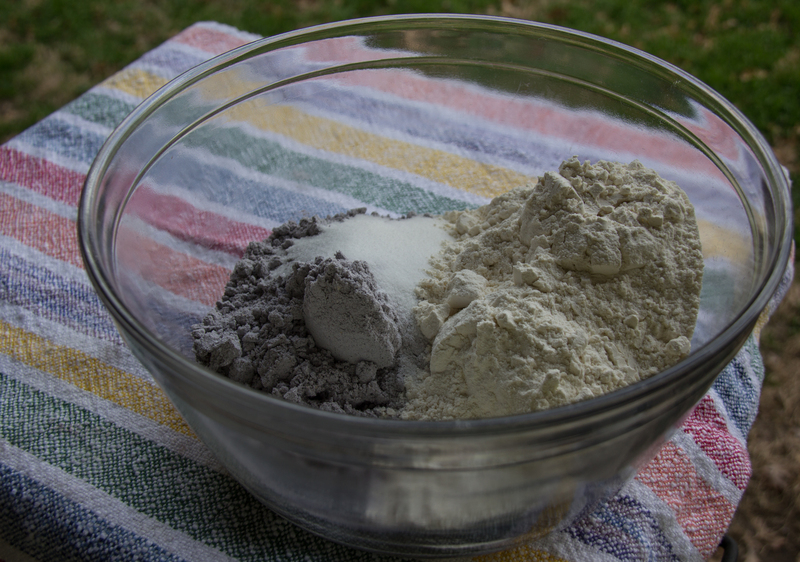 In a large bowl, mix cornmeal, flour, sugar, baking powder, baking soda and salt. In a separate bowl, beat together buttermilk, eggs, and butter. 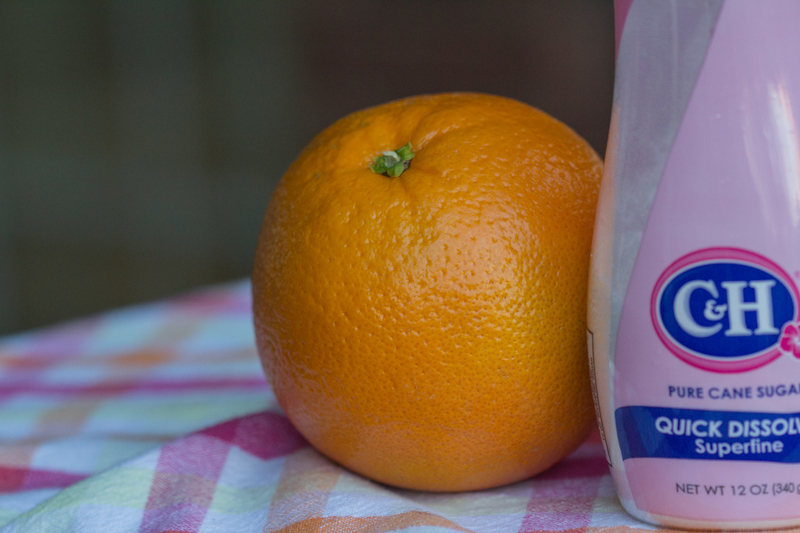 Pour the wet ingredients into the dry and gently fold together using as few strokes as possible. If there are a few small pockets of dry ingredients left, that’s ok.
Pour batter into hot Dutch oven and bake for 20 to 25 minutes or until a toothpick comes out clean. Check out this beautiful blue-grey color! The texture is so light with a tender crumb that melts in your mouth. I love this recipe and can’t wait to try it at a DOG (Dutch Oven Gathering) soon to share with our Prairie Dog friends. A bit of soft butter and a some local honey will be a perfect compliment to this beautiful cornbread. Thank you Brent for sharing this lovely gift that reminds me of northern New Mexico! I dedicate this to my Dutch oven friends Craig and Kim who cook with the Lewisville Lake Armadillos in north Texas. They pointed me to this recipe that celebrates healthy cauliflower that I tried it out tonight and love the results. 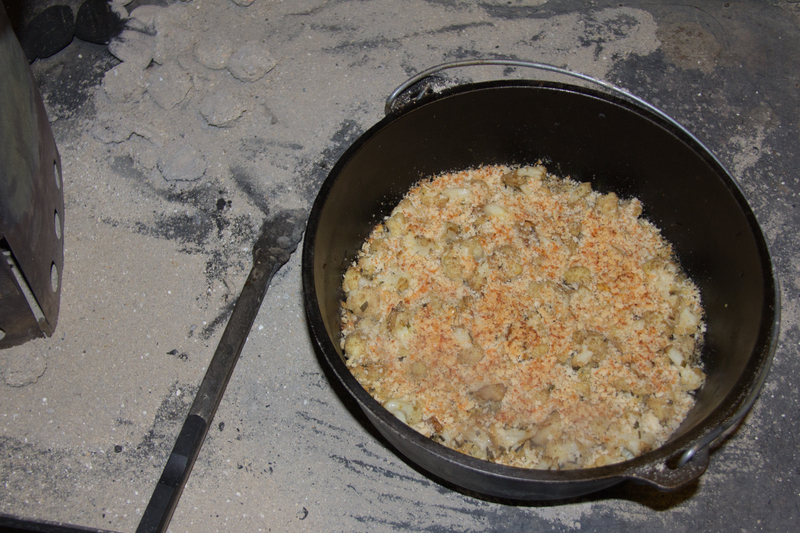 Prepare a 12-inch camp Dutch oven by spraying with Pam or spreading a light coal of vegetable oil around the bottom of the oven. 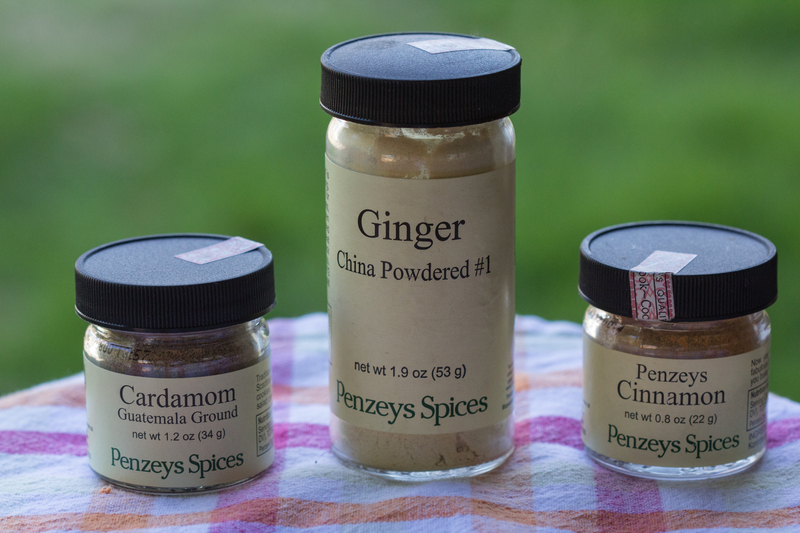 If your oven is an old-timer that has a lot of seasoning, don’t worry about this step. Fire up a big chimney of charcoal. You will need it! Getting your camp oven to a smoking hot 450F will take a big batch of hot charcoal. (For those who need to know – 33). 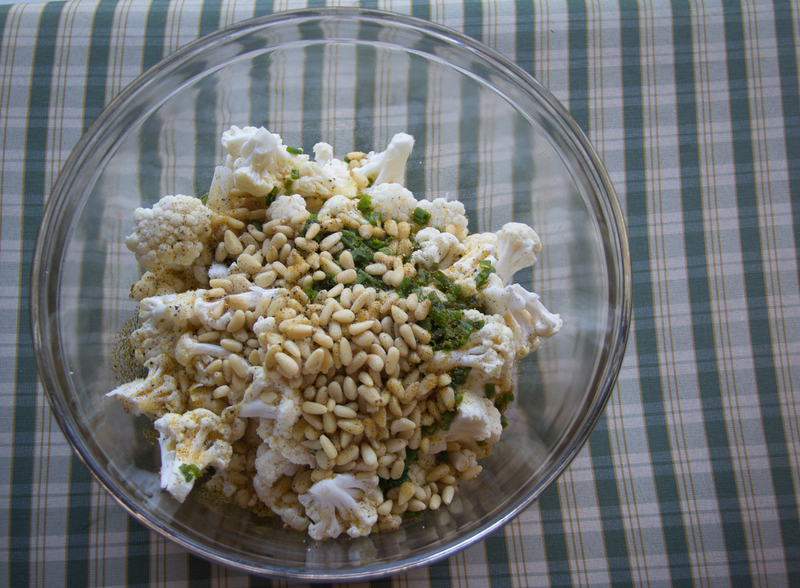 Mix cauliflower, oil, oregano, pine nuts, salt and pepper together in a large bowl, tossing all ingredients together until cauliflower is evenly coated with oil and seasoning. 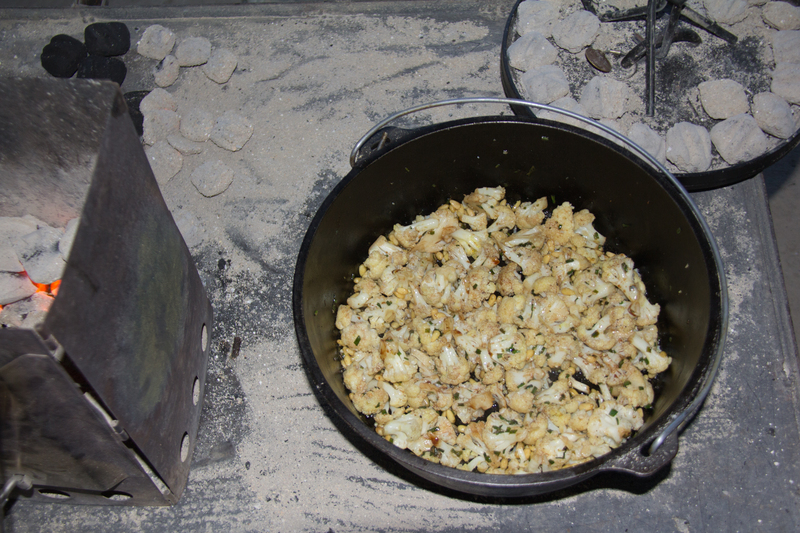 Pour into prepared camp Dutch oven and bake at 450 degrees Fahrenheit (22 hot charcoals on top and 11 underneath) for about 15 minutes or when cauliflower is fork tender. Remove the lid and place on a lid stand, keeping the hot charcoals on the lid. 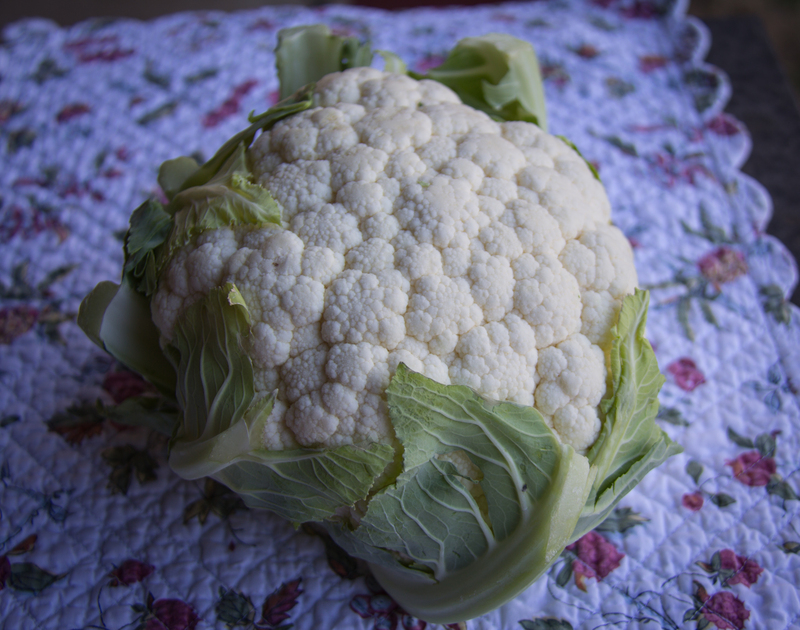 Sprinkle vinegar over the cauliflower and stir until vinegar is evenly distributed. Put the lid back on the oven and add any extra coals you may have for about 5 minutes. It is time to brown the top of the cauliflower and remove any extra moisture. 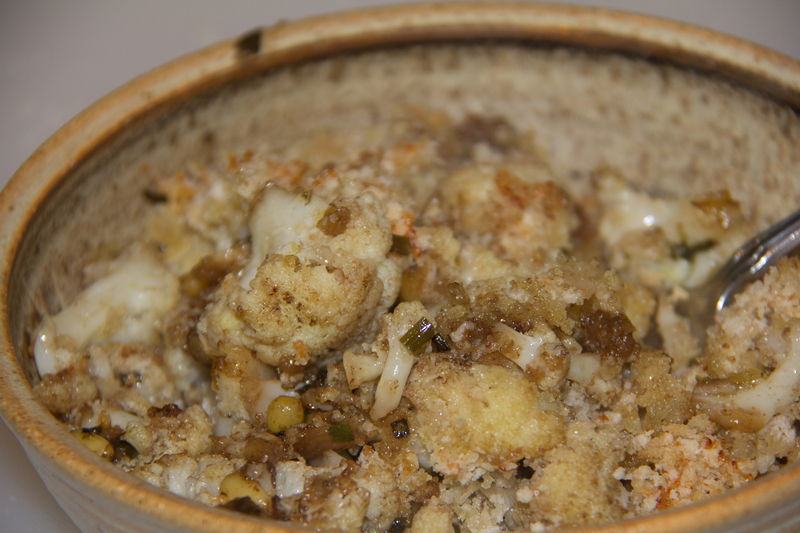 While the cauliflower is roasting, mix together cheese and bread crumbs in a bowl. 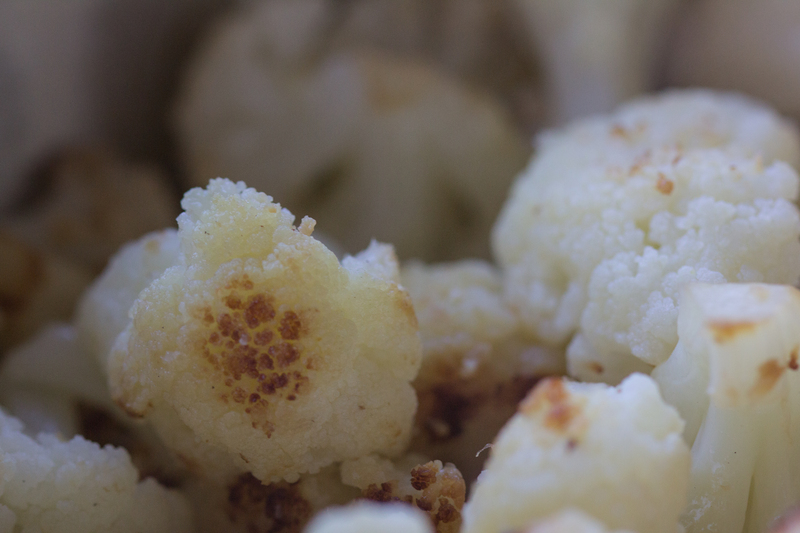 Pull the lid and enjoy the aroma of roasted cauliflower! Sprinkle parmesan and bread crumb mixture across the top. Replace the lid on the Dutch oven and roast until the cheese is melted and any moisture has evaporated, 5 to 10 minutes more. Oh this is so satisfying and wonderful! 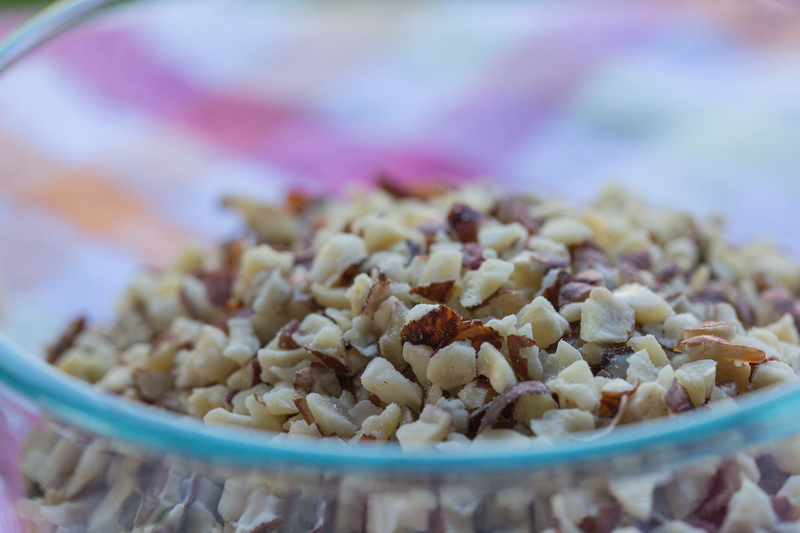 The crunchy topping of Parmesan and bread crumbs give way to the soft roasted cauliflower with sweet piñon nuts mixed in to each bite. Thank you Craig and Kim for sharing this great recipe!